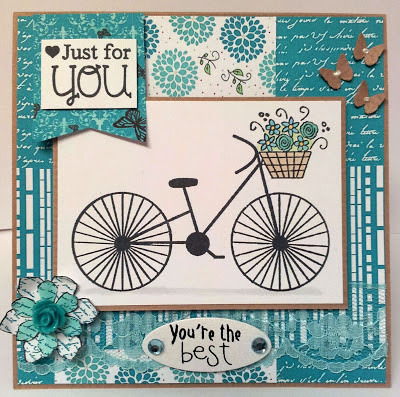 For this card i used the lovely new Bicycle Stamp. The flower was made from using the new Flower Shapes 1 Set. The sentiment is also from the set too. The papers are from the Simply Sweet CD all printed in the lovely Teal colours. I also added a bit of kraft some butterflies, a mini message and some jewels. Well I have a lovely project to show you today - something that's still upcoming for Dreamees! AND, it has inspired a whole CD jam packed with templates and gorgeous accessories to make projects like this for low-cost - I did make this out of card from a box that we had a parcel delivered in (I think it was the box our stamp materials arrived in...) which has worked fantastically. I have tried the project out of kraft card (300gsm) and plain white card (300gsm) which has worked a treat too - it does allow you more 'wiggle' if you use normal cardstock. I used die-cuts from our CD Cuttables 2 and Cuttables 3 - designed for any GSD cutter (eg. CraftROBO or Silhouette Cameo) - these include the lock & key, the sprigs in the flower cluster, the butterflies, corners, mannequin and cogs. 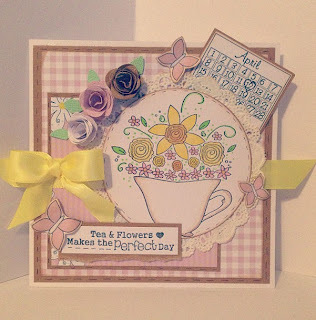 OH, and the 'Perfect Day' sentiment in the middle bottom section is a snippet of the sentiment in our Teacup stamp set! Have a wonderful Bank Holiday Monday! Today i have a card to show you that i made using the Bloomin Bright CD. Everything on this card was made purely using the Bloomin Bright CD and some white card, so you really can get everything you need from just the CD. It's so packed full of images such fav value for money. 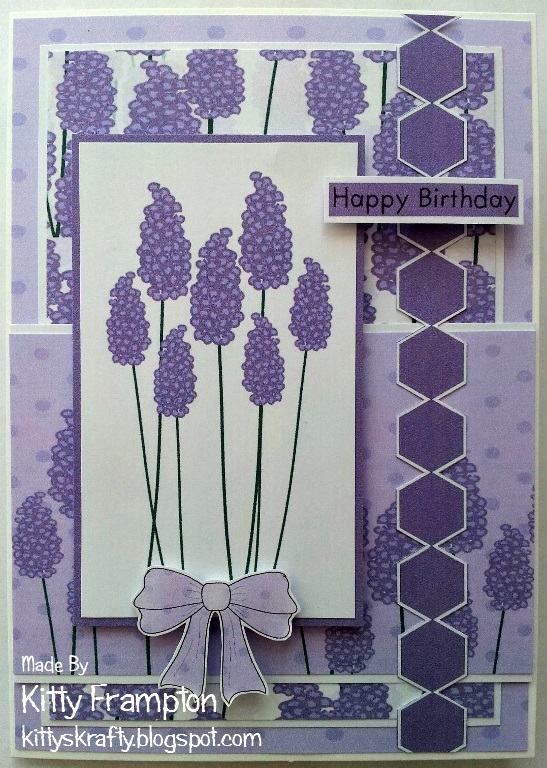 All the elements on my card were from the Lavender Themed section of the cd. It has everything that coordinates under this section, so you can match up all the colours and elements perfectly. 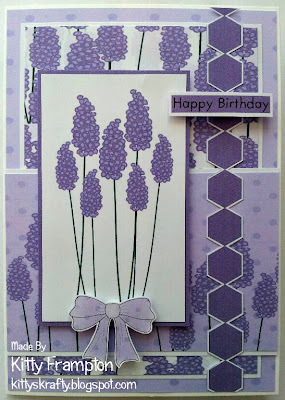 I used the Lavender Topper, Papers, Hexagon Border, Sentiments & Bow! You can grab the Bloomin Brights CD here, on offer for only £9.99 too, bargain! I'm doing well - Twice in one week!! 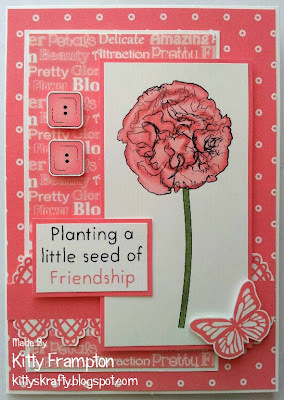 I've just put together our weekly newsletter which you can view online HERE and I decided to show you what we use our new flower stamp set for! Right, so firstly I tend to use three of the same size flower (these have been cut out leaving a white border and then distressed with Gathered Twigs distress ink - I've also stamped our Script stamp onto the petals. Keep one flat, trim into the centre of one (between any two petals - not between all the petals) and then cut one petal out of the final one. Obviously it could do with a button, pearl or brad in the centre to embellish. My second favorite way to use these flowers is to create a poinsettia. I've cut out three of the flowers ( 2x largest & 1 x medium size flower) and cut them right to the black line. I've coloured each of the flowers in red, except one of the largest I've coloured the tips of every other petal in green. I simply used promarkers. Curve the petals downwards again and layer them up left to right, offset slightly. Finally, add a gem in the centre! PS. PLEASE EXCUSE MY CUTTING - it was done very quick and is shamefully bad haha! Hope this inspires you to use our Flower stamps!! Wow, It's been a while since I posted on the blog. All papers and accessories are from the Gorgeous Girls CD - all new products (6 new stamps and 1 CD) will be available from Friday the 17th of May, I hope you like the look of them!! 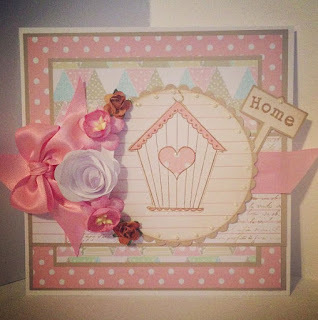 I also used our best selling Script stamp on the lined paper (across the middle of the card) - I distressed a circle of pink lined backing paper and stamped the house onto it, then paper pieced the heart and coloured in the scallops with a pink promarker. The large white flower on the left is on the new CD and the others are cherry blossom/tea roses which are shop bought. I added liquid pearls (White Opal) around the entire edge of the birdhouse topper. Again, the paper flowers are from the new CD 'Gorgeous Girls' as is the gorgeous calendar (I drew a heart around my birthday for this one!) - the cute sentiment comes with the Teacup stamp and that set is £3.00. I used to Tim Holtz Rock Candy to add some sparkle around the edge of the topper circle, to the roses on the left and to my topper too. Absolutely LOVE using it - its such a unique glitter! Images were taken on instagram so I'll be adding better ones to our facebook page when the daylight comes back around!